Movie Review: Cinco de May La Batalla (R). My ADD makes it hard for me to watch longer, slower epics – but when I’m riding my stationary bike at the same time – I can do it. 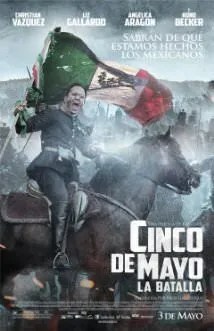 Yesterday I watched Cinco De Mayo La Batalla (Cinco De Mayo: The Battle) (it is currently available via Netflix). Didn’t know there was a historical battle behind the Cinco De Mayo holiday? Me either. Cover of Cinco de Mayo: La Batalla film (2013, R). It tells the story of The Battle of Puebla on May 5th 1862 when disciplined French forces (yup!) attacked a rabble of Mexican soldiers and civilian volunteers. Amazingly, the Mexicans came out victorious, and the battle was an encouragement to the Mexican people regarding their ability to withstand a seemingly superior enemy (in arms, experience, and financial backing). The film itself is an interesting – perhaps strange – collage. Early on it introduces two characters who seem comedic in nature (which is strange for a historical element), but as the tale progresses they lose their comedic elements. A romance between one of these characters and a third character adds another strange twist as we swap back and forth between scenes featuring military commanders strategizing and diplomats negotiating to these two lovebirds interacting. From a humorous perspective, my favorite part is the captioning. It is evident that the individual who translated the Spanish into English (almost the entire film is in Spanish, there is a very small spattering of English and French) was not a native English speaker – creating a number of awkward constructions. This said, it might sound like the film is a no-go. And the film has yet more against it – the shaky camera work (I think done in large part to hide the fact that while it is supposed to be pouring during portions of the battle, the sky is in fact clear and blue), cuts from and to scenes that seem nonsensical and too short to carry any meaning, and so on…but, actually, I really liked the film. I’m always a sucker for an underdog story – but I think it is the extended time spent on the actual battle that won me over. Unlike many modern movies which insist on insane camera work that makes me feel sick to give us a “hey, you are actually here” feel – this film uses a more traditional style reminiscent of 13 Days to Glory and John Wayne’s The Alamo. The film clearly portrays the absolute insanity of Napoleonic tactics at this juncture in history. At points I could barely stand to watch as lines of men walked towards each other, stood still, and then took turns firing into each others ranks, playing a form of roulette – lets see whose lines disappear first. The film is also quite violent. Just about every manner in which film technicians have developed to demonstrate the bloody horrors of wars is represented here. Many deaths are fairly bloodless (ala John Wayne) but others are horribly graphic. No, it isn’t that I like the gore…I do think that bloodless epics that glorify war are more detrimental to viewers than ones that portray war with its horrors. What really struck me – in a way few other movies have conveyed – is the hopeless plight of the common man in these situations. Napoleon III decides from across the oceans to collect on a debt owed France by Mexico…and this battle is only the beginning of many in which hundreds and thousands will die – the common man – while lofty politicians move men around like so many chess pieces. I’m not a pacifist. I understand the need for the use of force, even deadly force, in the maintenance of peace – but the film did make me think deeply about the wars we have been, are, and will be involved with…It struck me that perhaps for me, there will be a more active role to play in activism in the future – not to dissuade from conflict when necessary – but to ensure that the causes of conflict are actually those who force war, and not simply pompous men’s blustering or conniving thieves contriving sales. Next story LogMeIn Decides to Tick Off Customers in Bulk. Previous story Simple – Is It a Better Banking Experience?